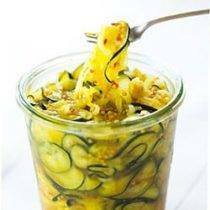 Sweet & spicy zucchini pickles! Sweet and Spicy Zucchini Refrigerator Pickles are the perfect combination of flavors! These quick zucchini refrigerator pickles from The Brown Eyed Baker are a great way to use up all of that late-summer zucchini from the garden!